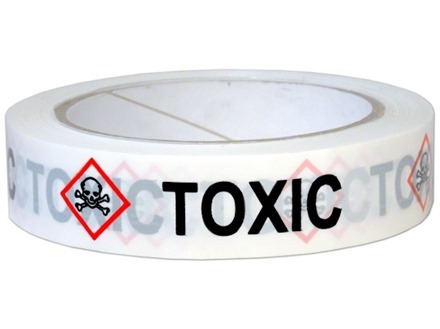 Home > Hazardous Substances & Chemicals > COSHH Warning Signs & Stickers > GHS Tapes > Toxic GHS tape. Serious health hazard GHS tape. 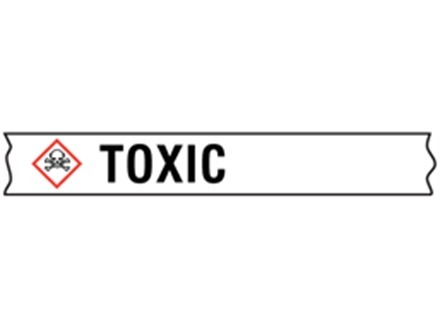 Toxic hazard warning symbol label. Toxic GHS tape to CLP Regulations. Self adhesive packaging tape to mark packages whose chemical contents can be toxic, and which can cause irritation or burning if in contact with eyes or skin, or internal injuries if absorbed or ingested. GHS tapes. Toxic. Packaging tapes for use on hazardous substances or dangerous chemicals, which can provide toxic risks to handlers. GHST006 Size 25mm x 66m. Material self adhesive vinyl.